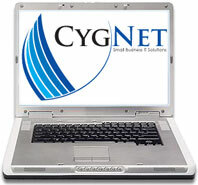 CygNet tailors highly-effective IT services for small businesses. CygNet understands the intricacies of desktop, laptop, network, and mobile devices and excels at making these components work together. We provide installation and upgrade services to give you the best system for your needs. We provide preventive maintenance to minimize down-time. And we troubleshoot problems efficiently to offer rapid, comprehensive solutions. As specialized IT support professionals, we are fully equipped to support all small-business IT needs, freeing you or your employees from needless distractions. We allow you to increase productivity by decreasing computer-related frustrations and costly down-time.